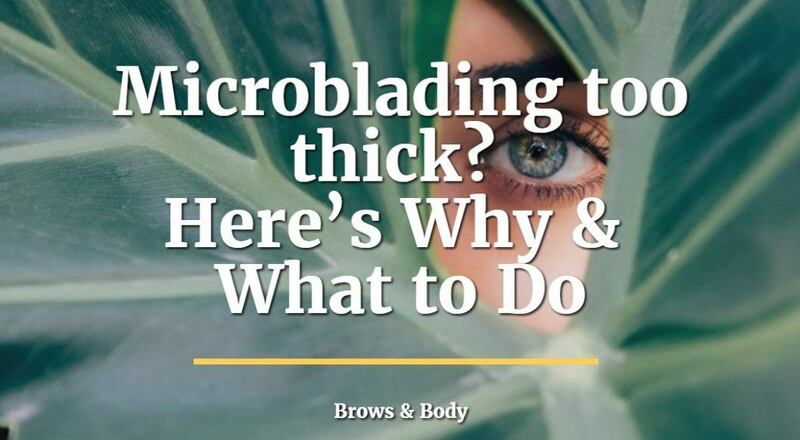 This post will teach you everything you need to know about how to deal with your brows if you think that your microblading is too thick including why they might appear that way and most important what your next steps should be. Are your Eyebrows Too Thick? You saw all of the amazing microblading before and after pictures on the internet so you decided you wanted to get it done. You carefully researched the best microblader in your town and you scheduled an appointment. They looked incredibly dark or too thick and you felt like they didn't match your face at all. Well let me set your fears at ease because there is a good chance that this is completely normal and not even something you should worry or stress about. It's actually not uncommon for people to feel this way (if you don't believe me just read the comments around this blog and you will soon agree!). If you fall into this boat then read through this entire post because it will help you understand what is happening and why. There are 3 main reasons that your eyebrows may appear to be too thick. Two of the 3 reasons are very normal and easily fixed (hint: you just need to have patience!) while the other is something that may need correcting. The bottom line, no matter what the cause of your thick brows is, is that you want to have some patience and try your best not to freak out. The first and most common reason that your brows are too thick is simply because of what I like to call an optical illusion. Basically what is happening is that you are seeing your face in a new light, you've been used to seeing your brows, to having control over them and suddenly they have changed and it's a little bit scary. The first is simply because of the change in the color or the darkness of your brows. Darkness will change the appearance of the brows without actually changing the width. Basically your brows may appear to be thicker simply because more attention is drawn to them because of the color. This is a very normal and common thing that happens after microblading. Often times the brows are made to be darker than normal because your artist knows that they will naturally fade over time and during the healing process. Most of the time once the brows lighten up the color fades and your brows will appear more normal. Just realize that you've been looking at your face for years and years and you are accustomed to it looking a certain way. Once any change occurs it's absolutely natural for you to instinctively reject that change. Do your best to just hold out and wait for 2 weeks and everything should be ok.
By the way, this reason accounts for probably 95% of all people who think their brows are too thick. You can learn more about the healing process including what to expect here. #2. They may actually be too thick! This is probably the reason you are most worried about and let me tell you that it does happen from time to time - but don't freak out! Sometimes, due to a number of reasons, including how your artist originally shaped your brows, your microbladed brows may actually just be too thick for your face. This could be because of a mistake, it could be because you wanted to replicate brows of someone else that shouldn't be on your face or for any other reason. But again, just like #1 listed above, don't freak out! The reason you don't need to stress too much is because this CAN be fixed in the touch up which you should have in 6-8 weeks. The good news is that as long as you trust your artist, and they know what they are doing, this can be fixed. In addition, your brows will most likely fade and become more natural over the following 2 weeks so worst case scenario is that you have to walk around with thick brows for a few weeks. Another potential reason for brow thickness is because your artist did increase the thickness of your brows but he/she did so to match your face. Sometimes women, again due to a variety of reasons, have thin brows as a starting canvas. While it is totally up to you to pick the thickness of your brows, the shape and style, sometimes your artist may take artistic liberties to "normalize" your existing brows. This can cause a freak out for you if you are used to super thin brows and suddenly you have thick brows. Just like #2 above though, it is definitely fixable. This one also holds true for people who have medical conditions such as thyroid disease which result in a reduction of your brows. So what are you supposed to do if you feel that your brows are too thick? For best results please, please, please listen to the guide below. The last thing you want to do is make a huge decision such as fading your brows when time may be the only thing you need! The first step is not to freak out. You may feel that your face isn't your own or that you don't feel comfortable in your own skin but just realize that this won't last forever. The absolute worst case scenario is that your brows will fade naturally over the next few months and you will be back to normal in that time. Best case scenario is that your brows will fade slightly and you will absolutely love them. #2. Talk to your artist! Make sure that you get into contact with your artist. I promise that they deal with this kind of stuff on a daily basis so they will know exactly what to do. Your artist may help you understand why your brows are the way that they are, and he/she may be able to guide you further to help determine if they can be fixed at the touch up. Even if your brows are indeed too thick it most of the time it can completely be reversed or fixed in your touch up. During your touch up (which should be mandatory for people who get their brows done) your artist will be able to re-shape (to some degree) your brows. This means that they can fix the color, the thickness, the depth, the tail and so on. But the key is to let your artist know what you are happy with and what you aren't happy with. As long as you communicate with your artist they will be able to help you. If you are absolutely 100% sure that you hate your brows then you can consider fading them early by using certain techniques that I've discussed here. I do not recommend you go through this step because it is so natural for my clients to have a little "freak out" once they see their brows. This freak out session tends to fade away very quickly though and over a few days as they get used to them. So don't run and jump into the fading process unless you are 100% sure. Microblading your brows can be an amazing experience but it isn't without its ups and downs. Having said that please make sure that you don't make any snap decision regarding whether or not you hate your brows! Give the healing process some time and TRUST THE PROCESS! Following these rules will help you get the most out of your brows. Are your brows too thick?